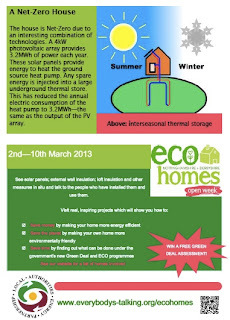 There is a programme of visits to Ecohouses in the region, from 3rd-10th March. 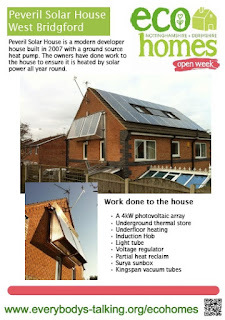 Peveril Solar is one of the houses on the list and we are open on Sunday 3rd March at 2pm and 330pm. You need to book ahead by emailing info@wbecohouses.co.uk or DNC at dnicholsoncole@gmail.com . This is the leaflet by Everybody's Talking, who have arranged the event. It includes a succinct explanation of the technology. Peveril Solar is the first house in the UK to be entirely solar heated all year round. Although the official time is 3rd March, you might be reading this after that date, but please be assured, that visitors with a serious interest in Solar Earth Charging are welcome at any reasonable date, by first emailing the DNC address above.